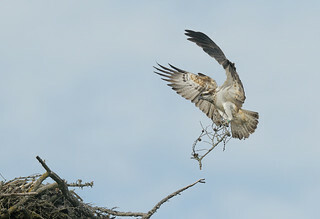 Female approaching the nest with a branch to add to the structure. In the UK a licence is required to photograph certain rare birds on a nest, this includes the Osprey. In Scotland the licensing authority is Scottish Natural Heritage and a permit was obtained from them for this site before taking this photograph. The purpose of the licence is to protect the birds ensuring that only suitable nest sites are used and that appropriate procedures are followed, demonstration of some experience in photographing nesting birds of species that are not threatened is also required. It is a process that is not only a legal requirement but which also serves to protect the birds. Please never photograph a restricted species outside the licencing scheme.